THE EARLIEST CHRISTIAN WRITERS show us a potent church at work, uniting believers of different races, sexes and economic levels, a church rich in prophecies, healings, exorcisms and powerful preaching by numerous leaders. But the Spirit began fading through the 200s, until by the time of Athanasius in the 300s the miraculous acts of God were on the wane, the leadership of women had been curtailed, orthodoxy was threatened, and church unity had virtually disappeared. What happened? The Didache was one of several Syrian church discipline manuals that came to define church order in the Near East. This 2nd-century document dealt with the proper conduct expected of and expected toward itinerant ministers who apparently had begun to abuse Christian hospitality. It is remarkable in many ways, among which is its introduction of a negative Golden Rule: “All which you may wish will not happen to you, you also do not do to another” (1:2). This recasting of Jesus’ words from the positive to the negative serves as a synecdoche for the whole book; the Didache introduced into early church literature the infamous lists of “don’ts” that would come to characterize much of the Christianity that would follow. As a result, Christian freedom was sharply curtailed. In 1 Corinthians 8 Paul leaves the eating of food offered to idols up to the individual Christian’s conscience, cautioning each Christian to consider those weaker in the faith when deciding how to exercise Christian freedom. But in the Didache, individual conscience has been superseded by ecclesiastical rule: “ . . . keep strictly away from what is offered to idols, for that implies worshipping dead gods” (6:3). What was once a caution is now a rule. Jesus said to baptize. But the Didache specified how to baptize. The Didache also required fasting of Christians, on Wednesdays and Fridays. Jesus told His disciples that they should not vainly repeat ritual prayers the way the pagans did, but the Didache ordered Christians to repeat the Lord’s Prayer verbatim, three times a day. About 96 A.D., Clement of Rome gently corrected a schismatic group of young upstarts in the letter we call “1 Clement,” but only a few decades later (if that) the Didache was fiercely advocating the practice of shunning those with divergent views. Indeed, the spirit of the Didache must have been stifling for the average churchgoer. One exception to this trend is that prophets were not restricted when speaking or acting under the influence of the Holy Spirit. Going overboard in one of its lone concessions, the Didache identifies prophets as the church’s high priests (13:3). The implications of this statement are enormous. In the New Testament and especially in Hebrews, no one in the church is called a high priest except Christ Himself. But this casual appellation by the Didache effectively ends the priesthood of all believers, for now another high priest is instituted on earth—the prophet. Appropriately, church people are instructed to give these prophets their “first fruits” of money and clothes. The Didache further restricts these offices to males (15:1), despite the fact that, early in the 2nd century, the governor of Bithynia, Pliny the Younger, had found it necessary to torture two female ministers (ministrae) in order to gain more information from them about the activities of Christians (Letters of Pliny X.96). Restricting women, as we shall see, directly rebounded on men in the restrictions made by later church orders against unordained male leadership. The inevitable result was that most believers were discouraged from exercising their spiritual gifts. From Paul’s letters in the 1st-century, through Justin Martyr’s in the mid-2nd, we find evidence of the widespread use of spiritual gifts. But the chains that were binding women and laymen were also tightening on the exercise of spiritual gifts in general. The church had its reasons. About 170 A.D., three self-proclaimed prophets—Montanus, Maximilla and Priscilla—began replacing the Scriptures with their ecstatic utterances. Ecstatic prophecy quickly began to be identified with the lunatic fringe of this heresy. Meanwhile, secular intellectuals like Celsus had begun attacking prophecy in general, so that by the time of Origen and Irenaeus in the 200s, Christians had to defend the exercise of spiritual gifts like exorcism, prophecy and healing (Eusebius 5:7:3–5). Ronald Kydd, in his interesting study Charismatic Gifts in the Early Church, speculates that from 200 to 260 A.D., the Christian community grew, attracting wealthy congregants and attaining social respectability. As the level of members’ education rose, and as church organization became more formalized, the gifts of the Spirit just quietly slipped away. No one really missed them. In fact, in the view of many orthodox Christians, the heretics had co-opted the gifts. The problem was that the church did not just keep public opinion in mind—it catered to it. This high regard of public opinion, especially as the church became more socially acceptable, along with the worries over church purity, caused the church of the 200s not merely to regulate the use of spiritual gifts and pluralistic leadership, but effectively to eliminate them. 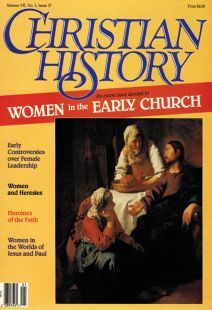 Thus the leadership of women and laymen was generally curtailed, and the gifts of the Holy Spirit were largely quenched. Dr. William David Spencer is pastor of encouragement at The Pilgrim Church of Beverly/Salem, Mass. He also teaches at Gordon-Conwell Theological Seminary.